Coming up we'll hear from top resource analyst and fund manager Frank Holmes of U.S. Global Investors. Frank discusses what it's going to take to get the metals moving again, and why gold and silver continue to have a tough time. Don't miss my interview with Frank Holmes coming up after this week's market update. Well, as the U.S. dollar and stock market continued to rally this week, technical selling in the precious metals markets accelerated. Gold and silver markets broke near-term support levels last week, begetting some momentum selling that carried over in a big way this week. Selling on Thursday brought gold prices down near $1,100 an ounce. The $1,100 level managed to hold through Thursday's close, with gold prices finishing slightly above it, but that level has given way today. As of this Friday morning recording, gold now trades at $1,088 an ounce, registering a weekly loss of 4.8%. Turning to silver, spot prices tested the $15.00 level on Thursday. After dipping below it by a few cents during the trading day, the market managed to close with spot silver right at $15.00 per ounce. But like gold, the white metal hasn't been able to hold above its key level and it now has a 14-handle. Silver prices currently come in at $14.80, a decline of 5.1% on the week. Joining gold and silver in the latest selloff are the platinum group metals. Platinum prices have shed 4.3% this week to trade at $945 an ounce. And the palladium market has literally been taken to out behind the woodshed this week. Palladium prices plummeted $70, or more than 10% through Thursday's close. However, palladium is actually managing a little rally so far today despite heavy selling pressure among the other precious metals. Palladium now trades at $618, down 9.0% on the week. The precious metals markets are struggling in the face of a rising dollar, a dynamic that has plagued it for well over a year now. The Dollar Index now trades at the top of the lateral range it's been in since May. If the dollar breaks to the upside, it could quickly challenge the multi-year highs it hit in March just above the 100 level. The S&P 500, meanwhile, is also nearing new highs. The benchmark stock market index appears to be on track to post a gain for the sixth consecutive week. Near-term momentum gauges for the stock market are now extremely overextended. Instead of crashing in October as some had predicted, the stock market went on a tear to the upside. A lot of market commentators were hyping up a possible stock market crash this fall in conjunction with the Shemitah 7-year cycle. Anything is still possible. The more extended a market gets to the upside, the greater the likelihood of a hard landing. But markets can stay overextended for months or even years before the reckoning comes. No one knows when the next big crash will occur. When everyone is expecting a crash that seems to be when it's least likely to occur. Of course, central banks around the world are intervening to try to prevent stock markets and economies from tanking. China's central bank has cut interest rates six times over the past year to try to revive a slowing economy. The moves have depreciated the Chinese yuan. Yet behind the scenes, Chinese officials continue to buy gold. According to data from the China Gold Association, official buying rose in the first three quarters by 7.8% compared to that same period last year. Central bankers like to portray themselves as far-sighted and proactive. But in recent years they have proven to be short-sighted and reactive. Federal Reserve chair Janet Yellen has repeatedly backed down from vows to raise rates and can't seem to get her story straight on the economy. Perhaps she's as confused as her rhetoric is. On Wednesday, Yellen told a U.S. House of Representatives committee that if the economy deteriorates, she would be open to pursuing “potentially anything, including negative interest rates.” So if the Fed ever does finally budge from its zero interest rate policy, it could well be to ratchet rates down even lower. A stock market meltdown between now and the Fed's December meeting would certainly raise the odds of a non-hike – or possibly even a radical new venture into negative rates. In the meantime, throughout the month of November, Money Metals Exchange is offering free shipping on any order of $500 or more. That's free shipping on any gold, silver, platinum, or palladium bullion products that total at least $500. Invest at least $5,000, and you'll not only get free shipping; you'll also get a free Silver Eagle! This special promotion is good for the entire month of November. And with spot prices still near 5-year lows, now may be an opportune time to take advantage of it. Just visit our website at MoneyMetals.com or call 1-800-800-1865 to place your order. Mike Gleason: It is my privilege now to be joined by Frank Holmes, CEO and Chief Investment Officer at U.S. Global Investors. In 2006, Mr. Holmes was named “Mining Fund Manger of the Year” by the Mining Journal. He's the co-author of the book The Goldwatcher: Demystifying Gold Investing and is a regular guest on CNBC, Bloomberg and Fox Business. And you can find his company as well as his renowned "Frank Talk" blog at USFunds.com. Frank, it's good to have you back on. Thanks for joining us again. Frank Holmes: It's great to be talking with you and your followers. Mike Gleason: To start out here Frank, we saw some really positive price action for the metals in October, but they've been slumping again this past week. This market just can't seem to sustain any really upside momentum. What's going on here? Frank Holmes: I think what happened was with the Fed, the thought there was a 50% probability that they were going to raise rates in December now. And the 10-year government bond... it's so important for gold investors to monitor and track what the 10-year government bond is doing. The yield was almost 2.6% a couple of months ago, it fell down to approximately 2% and now it's 2.25%. So we've got an 8% rise in the 10-year government yield in basis points, it's so de minimus. But it does have a very significant inverse relationship to gold prices so that yield rising, immediately starts to push gold down. Mike Gleason: You mentioned the Fed there, once again we seem to have Fed watchers putting a tremendous amount of stock into the rhetoric rather than the actual policy decisions. Are you surprised that despite not having to raise rates in more than 9 years now, markets still get spooked at every interest rate highs. To me it's astounding that commodities, especially gold and silver are acting as if we're seeing hawkish policy coming from our nation's central bank but that's not the case at it. It all seems to be talk. What are your thoughts there? Frank Holmes: I do agree with this thing on talk, and what people don't realize is the whole argument for formal or substance. That thought process is so often used for fraud, and when someone made a commitment verses some substance, the formula there but fell apart. The same thing happens in investments, and a lot of times it's not so much that it's fraud, it is that people say one thing and underneath that substance that tip of the ice burg that you hear and see but really underneath it is a substance of something else. And what has happened with that is zero interest rates, the Fed Funds being zero and everyone focuses on what is called nominal rates, the Fed Funds (rate) is zero, so that's what everyone focuses on, and they're going to raise rate by 25 basis points. That's the nominal rate, which is more significant to the action of gold is real interest rates matters what would the government pay you on 10-year government bond minus the monthly CPI number. That is much more significant in all the research we've done with gold prices are the interest rate differentials on the real influx, after inflation coupon the government is going to get paid. We look back at the peak in September 2011 for the price of gold at $1,900 the 10-year government bond had minus 3% yield. So you took whatever they were paying you, took away the inflationary rate and you were losing money. So why would anyone buy that? And that was the reason for gold to hit that $1,900 (number). Then real interest rates, rates on the 10-year government bond went from 1% to 2% to 2.6%. So we went from minus 3%, inflation was higher back in September 2011, then inflation fell to very low levels, and the interest rate rose. So all of a sudden you had positive interest rates went up 550 basis points, and any time that's happened, commodities take it out on the chin and so do emerging markets and the dollar soars. What you get is a crisis and then they start a reversal. So based looking back at 30 years of data, the math, the odds favor that the dollar would be weaker, that real rates will not be as positive and gold will rebound along with immersion markets. Mike Gleason: Obviously a lot of what's going on here in the commodities as you mentioned is a strong dollar generally equals weak commodities since they are priced in dollars. We do have a strong dollar relative to these other fiat currencies around the world. Mario Draghi again talking about some more stimulus measure, Quantitative Easing measures there in the euro zone. Do you expect a reversal to this strong dollar trade that has really dominated the currency markets that's been weighing on gold and silver. Do you expect a reversal there maybe? 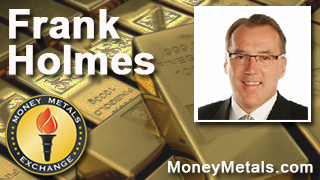 Frank Holmes: I think the that question has to go for the Fed, they don't care about gold except for it's money. They do care about that is sound money because they don't keep the other countries' currencies, they only keep gold. It's the only thing they trust. I think what is more important is that when you're looking at all these press releases of S&P 500 Companies lamenting about their pains of a strong dollar and they can't export, or their product, doesn't matter if it's Tiffany's or it's Caterpillar. There's this concern that the strong dollar is shaving off a lot of earnings and I think that that's more significant for Fed-making decisions. I think that for investors what's important, and what we look at and have written about many times, it is better to focus on what's called PMI which is Purchasing Managers' Index because it's forward looking and it re-calibrates its data every month. When people look at GDP and metaphorically it's like looking out your rear view mirror. It's what's behind you. When you're driving you can't stare out the rear view mirror, you can check it before you switch lanes but you have to stare where you're going and that's going forward. And the PMI is a great tool to try to measure the temperature going forward and it's highly correlated to the commodity demand. So what was about this week that I thought came out was getting ready for the big liftoff is that global PMIs turned positive. China turned positive, America's positive, Europe is positive, and when you get global PMI turning positive, the math suggests that in the next three months or six months you'll see rise in commodity prices, in particular for copper and gold and oil. One of the big key factors for a huge liftoff will be when China gets above 50. The other countries that I mentioned, economic power bases like the EU is that they're above 50 and that the 1-month is above the 3-month so that's a much stronger positive stance. But when China gets above 50 the commodity demand picks up exceptionally. So I think that we're going to see, with next year being an election year in America, I think that the odds of them lifting interest rates going into an election year are slim. And I think that global PMIs look like they've troughed, if you look at cycles. So with that, I think that we'll see a bottom in the mining industry this year, in mining stocks, and we'll probably see commodity prices firmer next year. Mike Gleason: Continuing there on the mining sector you're down in Peru as we speak at a mining conference. What's the state of the mining industry right now? You obviously follow that as closely as anyone having been honored in the past by those who rank sector analysts like yourself. What are you seeing there and have we maybe see a bottoming in the miners? Frank Holmes: I think that's there's a very cautious bottom. I think exploration is going to change. I think it's going to be very difficult to raise capital for exploration. So as the world continues to have babies, they're trying to get reserves to fulfill in metals etc. It's going to be much more expensive. I think the environmental costs, the social license, all these things are costing a lot more money and I think in the next 10 years we'll see huge changes in the commodity prices because we're going to get supply restrictions. Now when we look back over the past 15 years, there's been one trillion dollars spent on mining. One trillion. What's interesting when you look at that macro, big fat juicy number, is that you see that 300 billion dollars into iron ore and 300 billion dollars into coal predominately what they call metallurgical coal and you need metallurgical coal with iron to make steel. What do we have? A huge surplus for the next decade of iron ore and met coal. Only 150 billion dollars was spent on copper and 150 billion dollars was spent on gold, and there's much less supply on those metals in the next ten years. When we look at zinc and metals like that, there's even substantially less so we could see a surge in zinc prices, a surge in some of these other base metals, but not iron, not coal, not met coal. So I think these are interesting aspects to take a look at. Peru is copper. Peru's currency correlates with the price of copper, so what's happened is that the price of copper has declined, so has the currency value so the cost of paying local workers hasn't changed. It set itself so that it wasn't a burden. If they had a stronger currency and the copper price fell, then they'd have a lot of pain. What we are seeing in many of these countries is that the weaker currency is actually helping some of these countries and lower energy prices to produce their metals, that has also been a big benefit in the cash flow. Mike Gleason: What's the general mood among the mining sector? You're down there. You mentioned that you were impressed with the turnout for those that came to this conference. What's everybody thinking there? What's the general mood among those in the industry? Frank Holmes: They're looking for very selective opportunities. But they're looking. There's money there and looking for, sifting through opportunities. Much more (of it) is what's called brown fields, where there's already a deposit, there's money to develop to bring it into production. Grassroots exploration, there's no capital. I think it's important (to note) that the global recovery has started. It doesn't go straight up every year or every month but all the purveyors in the beginning of October... it was an incredible month. When you take a look at the S&P, what the different sectors did, and the worst performing sectors in the market that was up was utilities, less than 1%. But materials goes up 9.98%. Huge surge so I think you've found a bottom, and it'll settle in and get ready for the next turns. Mike Gleason: The last time we had you on was back in the summer, and we were in the throes of some unprecedented buying in the physical bullion market. Now that seems to have abated in recent weeks finally, and we're getting back to more modest levels of retail interest. But given the seemingly unstable footing that we may be on right now in these economic markets with Fed policy and currencies and so forth, do you foresee any events which could get things moving in the metals markets again, maybe something to bring back that fear trade you've been talking about? Frank Holmes: Well the fear trade is predominately rapid money supply growth, which we're not getting. It's not taking off. When we look at emerging markets in 2011 the seven most popular countries had money supply growth up 17%, compound it now it's up 10%, so it's fallen 70% basically. So if you've got that turning and you have real interest rates, so let's say the U.S. economy trips up and starts to slow down then rates in the 10-year government bond falls and inflation starts to rise then you get a spike in the price of gold. So really you've got to follow real interest rates, and the money supply to understand that fear trade. For the love trade, it's so important to see that China and India turn the corner... that they're economies, in particular China, gets their PMI, the Purchasing Managers Index, above 50 and maintains that the one-month is ahead of the three-month. That will create that big move and there will be a nice move. It won't be straight up right away, it will be gentle, but rising. Mike Gleason: Well, Frank, as we begin to close here and let you get back to that conference is there anything else that you would like to share with our audience here? Frank Holmes: I think the big part for them is to make sure they have balance-weighting. When we talk about stocks we like to stocks that have high cash flow returns on invested capital, growing in dividends. In that whole universe I've always recommended for individual stock picking that you should buy and look at the royalty companies because they have the strongest dividend growth for all the mining companies. And you have this balancing factor that you have 5% in bullion, 5% in gold stocks and the other 90% is invested in good companies, short-term fixed income and something like our short-term tax free NEARX, which has 20 years of positive performance. Only 25 out of 25,000 funds have delivered that very short term stable yield. And you park your money looking for an opportunity to buy stocks. Mike Gleason: Wonderful insights as usual, Frank. I know you're busy, and you want to get back to that conference, so it was great talking to you again. We really appreciate your time, and we hope to catch up with you again down the road. Now before we let you go real quick, if you can tell our listeners a little bit more about your firm, your services, and what you've been working on recently on your fantastic "Frank Talk" blog. Frank Holmes: The biggest thing that's exciting for us so far this year was launching our first ETF and that's JETS, and it's the airline industry. And when you look at Barron's they wrote about twice how it (the airline industry ) is the most undervalued industry group in the S&P 500 when you look at cash flow multiples and growth and dividends. And it's a good hedge against falling oil prices, they benefit dramatically towards the inverse. So that's been exciting for us. On Frank Talk, what's important investors is our discipline of always looking back over last week and finding three strengths and weaknesses that impacted the category, such as China or it could be resources or it could be gold. And then looking forward only one week, what would be an opportunity and a threat. What would be three opportunities and three threats that we could have occur and it helps us to manage our expectations. And I think that's really helpful and useful. And that's why we have 40,000 readers and 170 countries. Mike Gleason: Very good stuff there, enjoy the rest of your conference and safe travels as you head back. Thank you again. Frank Holmes: Alright, happy investing. I'm off to Australia. Find out what's happening there. Take care. Mike Gleason: Well we'll catch up with you down the road. Now that will do it for this week, thanks again to Frank Holmes, CEO of U.S. Global Investors. The site is USFunds.com. Be sure and check out that as well as the previously mentioned Frank Talk Blog, some of the best market commentary you'll run across anywhere. Again you can find all of that at USFunds.com. Check back next Friday for next weekly Market Wrap Podcast. Until then, this has been Mike Gleason with Money Metals Exchange. Thanks for listening and have a great weekend everybody.